Remote Gurrampeta, a tribal hamlet, seemed hardly the ideal place to distribute smart cards after an experiment with sophisticated personal tracking or access control systems. The backward village with 150 families was poverty-stricken and calamity prone. All that the tribals here wanted was a decent livelihood that would give them at least a meal a day. So, when Kris Dev and his IT savvy team from Chennai hit this rural reach of Andhra Pradesh, carrying their ‘access technology’ equipment, comprising a biometric device, a 9″ by 6 “equipment weighing barely 500 gms, and a laptop, the villagers did not exactly jump with joy. ”In fact, after setting up the equipment to start their experiment, it suddenly struck us that there was no power supply to Gurrampeta village,” says Kris Dev, a management and ICT consultant, specialising in decentralization and e-governance, co-founder of the Life Line 2 Business (LL2B). He recently won the Manthan Award in the category of ‘e-inclusion and livelihood creation.” The April 2006 experiment by Kris and his team in three villages of Andhra Pradesh, Gurrampeta (V R Puram Mandal in Khammam District), Mohammedabad and Jakulla Kootha Palli (Amadugur Mandal in Ananthapur district) coming under the National Rural Development Employment Guarantee Scheme (NREGA) for ‘Biometric Tracking of Payments under NREGA and others’ was adjudged the best among 25 states in India. Back in Gurrampeta, Kris and his colleagues, found a 6-volt car battery and kicked off their experiment which promised to usher in radical changes at the grass root level ”where villagers working in agricultural fields, construction sites or factories were always being exploited by greedy, corrupt middlemen.” Their village initiative had been possible only after several rounds of counselling and explanations. It was quite understandable, as the villagers had only recently been taken for a big ride. Soon after the 2005 floods in coastal Andhra Pradesh spread over Khammam district, the Hyderabad-based Centre for World Solidarity, a NGO, announced solatium of Rs. 500 each for many villages including Gurrampeta. ”A middleman, authorised to distribute the relief money, put his thumbprints across 135 names of affected villagers and pocketed funds worth Rs. 75,000,” says Kris. Only 15 villagers actually got the relief. Kris explained to the disillusioned villagers that this would never happen with a biometric device where each of them would have a ‘unique identity’ by registering their thumbprint into the machine and their photographs integrated through software. So, every time they put their thumb on the optical scan for verification, their photographs would pop up. 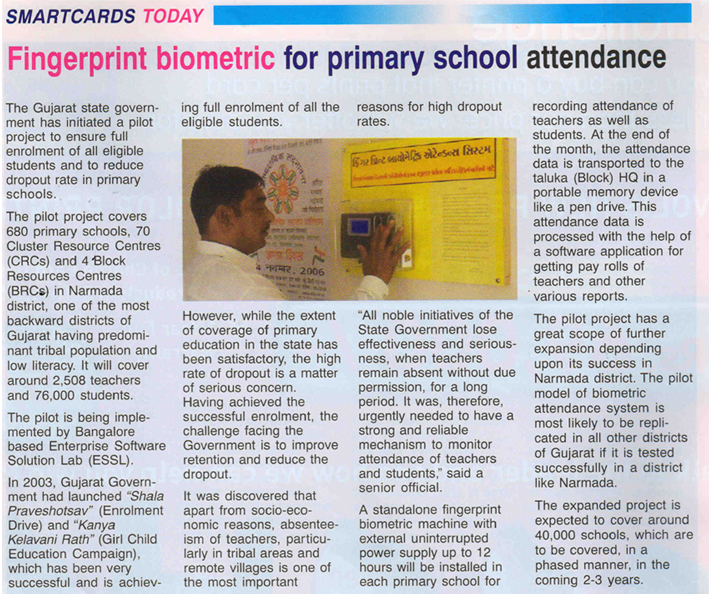 The biometric device has a provision to enter the citizen’s ID and displays the ID and name on a LCD screen. ”When a villager signs in for work, he registers on he biometric device. He does the same when he finishes work. So, there is an official record of the man days he puts in which cannot be tampered with and he has to be paid for work done on those days. We have work records (muster-rolls) in villages showing how supervisors have tampered with number of working days of villagers so that they could pocket the extra cash,” said Kris. ”A biometric-based smart card where the citizen uses the information of what he has, what he knows and what he is, ensures a high level of security,” he added. Now, villagers of Gurrampeta, neighbouring Mohammedabad and J K Palli are thrilled with their new identity. But this was just an experiment. Convincing the policy makers to introduce the process on a permanent basis has proved to be more difficult. In fact, one officer wanted to know if the biometric device would work as well with work-worn hands as it did with his ‘soft’ fingers. ”We showed him that the device worked with everyone —a villager working with machines in a factory, whose work-roughened palms were full of corns and those working in cement factories,” points out Kris. So, while he had convinced villagers that a unique ‘biometric’ citizen identity would dramatically change their lives, the greater challenge has been to convince the various state and district administrations. The investment would be a mere Rs. 20,000 in every village for a battery-run biometric device in conjunction with a suitable software that can register citizens uniquely, avoid duplication, create a data base of citizens and permit online transfer of information for the district and state administrations to view online. Kris is still waiting with crossed fingers for the first invitation to a village in India for implementing the project.